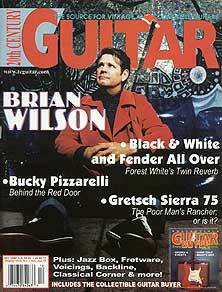 This article first appeared as the cover story of the December 1998 issue of 20th Century Guitar magazine with the title Brian Wilson And The Spirit Of Rock & Roll. Ten years to the month, the December 2008 issue with Dion on the cover turned out to be the final issue of the magazine. Looking back on the history of the Brian Wilson cover story / interview, when the Imagination CD came out in the summer of 98, no one could have predicted just how far Brian Wilson would grow musically in the 2000s. Produced by Joe Thomas and featuring a number of Wilsons finest songs and performances, Imagination was the key that unlocked Wilsons desire to bring it all back home again. 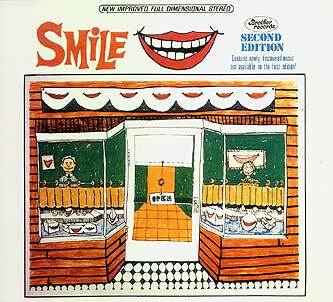 While following Wilson's studio work in the years before Imagination, I had acquired an impressive range of unreleased Wilson bootleg recordings with highlights including an incredible sounding Sweet Insanity album, another unreleased album with Andy Paley and the original 76 minute Beach Boys Smile album from 1966 / 1967. Its been a very rewarding decade watching Brian release a number of classic albums in these early 2000s topped off by his fantastic reinvention of Smile in 2004, Getting In Over My Head (with McCartney and Clapton + remakes of the Paley sessions and Sweet Insanity) up to and including his 2008 album That Lucky Old Sun. As the year progresses and we gear up for a new decade, the 2010 & preteens, it soon will be summer and as always that means, the sounds of the Beach Boys and the songs of Brian Wilson, forever the spirit of rock & roll. 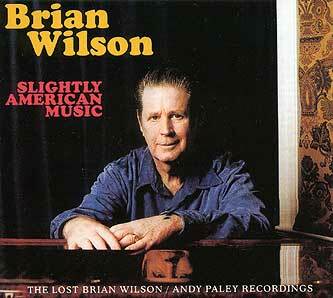 What an amazing year its been for Brian Wilson! The innovator of the classic California pop sound made popular by The Beach Boys during the 60s and 70s, Wilson returned with renewed vigor in 1998. Moving on following the tragic passing of his brother Carl Wilson, Brian dealt as best he could with this sorrowful occurrence then rallied his many fans with the release of his second solo album entitled Imagination, issued on June 16, 1998 by L.A.-based Giant Records. 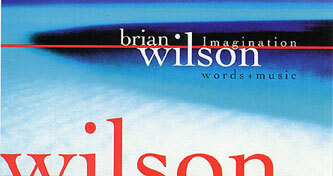 The album is Wilsons first official solo album in ten years. 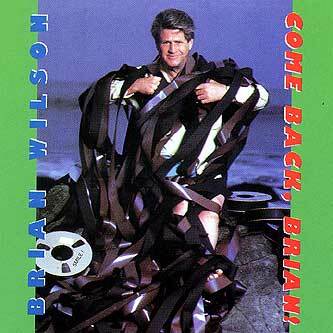 During the ten years prior to Imagination, fans had to seek out hard-to-find bootleg CDs in order to hear Brians genius at work. It is further evidence that the past ten years are considered a very productive time for Wilson indeed. To fully appreciate the significance of Wilsons dramatic return as an important solo artist a little history is in order. 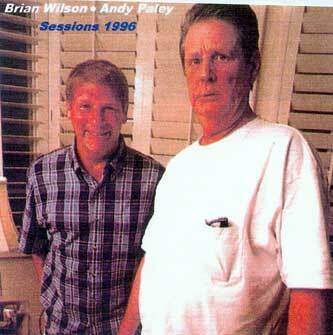 Following the release of his first solo album, 1988s Brian Wilson on Sire Records, Wilson again pushed on with (then) therapist/producer Dr. Gene Landy, and by early 91 they had just about finished what was to be Brians second solo album entitled Sweet Insanity. In an ironic twist of fate, the album was incredulously deemed unacceptable for release by Sire president Seymour Stein, who simply refused to release any of the new music Brian was making with Landy. Imbued with Landys healing vibes, Sweet Insanity turned out to be a most entertaining and thoroughly rocked out set with the definite highlight being Brians (still) unreleased rock anthem entitled The Spirit Of Rock And Roll. With walk-on vocals by the great Bob Dylan, the final available Sweet Insanity take of The Spirit Of Rock And Roll still remains a seminal rock and rock moment. 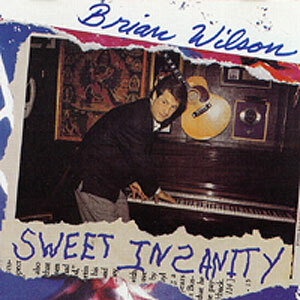 Following the lamentable shelving of Sweet Insanity by Sire, Wilson stayed close to his studio, recording gem after musical gem mostly on his own or with producer Andy Paley. A majority of these tracks have never been officially released, although a few years ago some of Wilsons home recordingsas well as various incarnations of Sweet Insanitybegan turning up on imported bootleg CDs with names like The Wilson Project and Come Back, Brian. After further regaining his mental and physical strengths, Wilson eventually parted ways with the spry Dr. Landy. During the 94-96 period, revitalized by a new found musical motivation, Wilson employed album producer Don Was for the making of a well-received video-biography on his life story (and the subsequent soundtrack album on MCA Records) called I Just Wasnt Made For These Times. Following the movie, Brianfor the first time in the capacity of lead vocalistteamed up with former musical confidant Van Dyke Parks on Parks 1995 Warner Bros. Records album Orange Crate Art. In the wake of these recent samples of Wilsons still-tremendous talents, fans of Brians years in The Beach Boys were treated to a pair of 98 releases on Capitol Records, which reexplored a variety of vintage tracks Wilson wrote and recorded for Beach Boys in the 60s and 70s. Supplying a wealth of outtakes and rare cuts, both the soundtrack CD from the Endless Harmony documentary and The Beach Boys Ultimate Christmas albums are imperative purchases for Wilson and Beach Boys fans. Prior to the making of Imagination, Brian once again teamed with producer and multi-instrumentalist Andy Paley, recording a number of tracks which still remain unreleased. Paley claims, It was really fun and very productive, inspirational and I hope someday all that stuff sees the light of day. A lot of good stuff happened but people havent heard it yet, thats all. Paley was also around during the making of Sweet Insanity and remembers that I worked on that. I sang on it, I played on it and I remember it very clearly. Paley looks forward to one day recording with Wilson again adding, I think his relevance is very great and that Brian Wilson is a fantastically gifted songwriter, arranger and producer with a fantastic ear for harmony. Asked to compare his recent work with Wilson and Imagination, Paley states I think that the music is very, very different. Lets put it this way...what he and I did is not an album. First of all, its way more stuff than you can put on an album, its probably more like four albums. It was something we enjoyed doing. 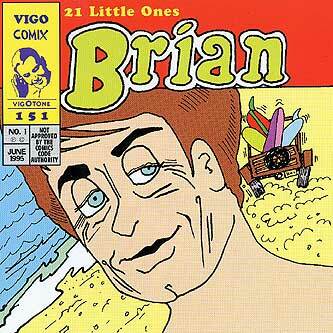 All of Brians diverse activities during the 90s set the stage for his critically acclaimed 98 comeback solo album. Up there among his major musical accomplishments since the heyday of the 60s, Imagination is clearly one of Wilsons best sounding and most fully realized projects ever. A treasure of fresh-sounding musical maps, Imagination was recorded at Wilsons home away from home outside Chicago and is greatly enhanced by the sonically-splendid co-production of Brians most recent musical collaborator, Joe Thomas. Imagination is propelled by a crew of veteran studio musicians including guitarists Jim Peterik, Brent Rowan and Greg Leisz as well as drumming ace Eddie Bayers and producer Thomas who effortlessly back up Wilsons complex, one of a kind vocal arrangements. 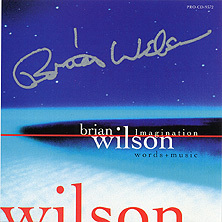 Completed at the start of 98 and released this past June 16th, Imagination was instantly hailed as one of the great summer albums by Wilson fans everywhere, including up-and-coming pop rookie Sean Lennon and guitarist Peter Buck from R.E.M, both of whom queued up for a chance to do print interviews with Brian. With the sounds of Imagination still ringing out its summer harmonies at years end, lets hope that it wont be long before we once again hear new music from one of Americas most imaginative living songwriters. Willing to speak to one of his long time fans and supporters, Brian Wilson took the time to speak with 20th Century Guitar and (then also) Time & A Word Music News editor Robert Silverstein for the following interview which took place by phone on Tuesday, October 27, 1998. Robert Silverstein (RS): Hello Brian! I just wanted to tell you that your new album Imagination is without a doubt the best album of the year. 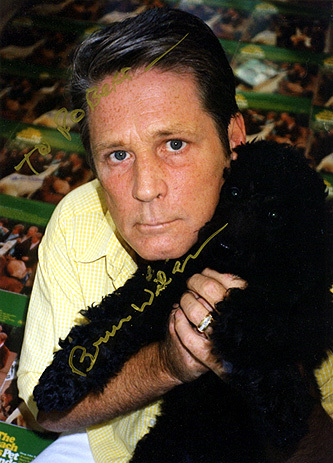 Brian Wilson (BW): Thank you. RS: I know its been a challenging year for you and I really appreciate you taking the time to speak with me. RS: The leadoff track on Imagination, Your Imagination is one of the catchiest songs ever written. How did you write that one? BW: My collaborator Joe Thomas and I were playing around at the piano, and he said, Why dont we just try to let it ramble. Just ramble, yknow? And we wound up with Imagination. We just let it ramble, it just went off the top of our heads. RS: I hope you agree when I say the album is the culmination of your career till now? RS: The song, She Says That She Needs Me features some beautiful orchestral touches. Is working with strings and brass a direction youd like to further explore? BW: Yes, I would like to get try to get into more strings and brass, absolutely! I love strings and brass, I think theyre very vital to music. RS: I was wondering why you chose to call the album Imagination. Was the album recorded at your house in St. Charles, Illinois? BW: Irving Azoff (owner of Giant Records) came up with the title. Yes it was recorded in St.Charles. RS: The interplay between the players on Imagination is brilliant. Who put all the musicians together? BW: I used the same players that Joe and I used when we produced The Beach Boys Stars & Stripes album (Nashville players). RS: The song Sunshine is a good example of the upbeat nature of the new album. BW: I was going through a sun worshiping trip and wrote that one. RS: Happy Days is a great album closer. BW: Its my favorite song on the album. Its my life on a recording! RS: The Imagination track, Where Has Love Been is another favorite of mine. A colleague from your 1988 solo album, Andy Paley is one of the songs co-writers. How is working with Andy Paley different than working with Imagination co-producer Joe Thomas? BW: Well, Joe is not quite as intense. Andys very intense. Andy kinda like, really gets it on pretty strong. And Joe is a little more laid back. He doesnt come on quite as strong. So Id have to say, yknow, Andy would be the stronger one. RS: Prior to the making of Imagination you wrote quite a few new songs with Andy Paley, including an instrumental called In My Moondreams. Will those tracks ever be released on CD? BW: We think so. We think the next record is going to be a little more hard rock. And Andy wants to join in. Weve got about 35-40 (songs) we wrote that we havent done yet. So our problem now is to try to figure out which ones to do. RS: Speaking of instrumentals, your song Pet Sounds is one of the coolest guitar instrumentals ever written. BW: I know, it was great wasnt it? RS: How do you feel about recording guitar-based instrumental music? BW: Well, it depends on what kind of mood Im in. If Im in the mood for a hard jam-rock, yknow a jam? Then I like to jam, if not, I like to play like...the introduction to California Girls, like a nice soft guitar like that or a hard rocking guitar. RS: The album you made back around 1990, Sweet Insanity has some great songs. The album was never officially released. Is there a chance it will ever come out? BW: We dont know where the tapes are! Someone made off with our tapes. Somebody made off with the masters. We cant find them. RS: So the bootleg is the only way to hear Sweet Insanity? RS: From that album, The Spirit Of Rock And Roll stands out as one of the most inspiring songs ever written. RS: Is there any chance you will ever rerecord it? BW: We might. We might put a little harder beat to it. Thats a good idea. I never thought of that! Id like to put a better beat to it. RS: The final Sweet Insanity version of Spirit featured a guest appearance by Bob Dylan. What was it like recording it with Dylan? BW: Well, it was quite an honor. I mean, he came in and it took him ten minutes to get his part and he split. But he did a really good job, very good job. RS: Do you have any reflections about the Sweet Insanity album? BW: I like Rainbow Eyes the best of all the cuts. And Smart Girls too. RS: Whats the most memorable part of the movie, I Just Wasnt Made For These Times for you? BW: The most memorable part was when I was in the car, when we went to my old school yard. The was the funnest part of it for me. RS: I really liked the movie quiet a bit. BW: Its real spine-tingling. I agree, I think its great too. RS: Your vocals on the 1995 Van Dyke Parks album Orange Crate Art were stellar. Do you have any favorite tracks from the album and is there any chance of writing new stuff with Van Dykes lyrics? BW: I loved Palm Tree And Moon. I would love to work with Van again. Hes a brilliant guy. RS: Do you miss playing bass? Would you ever consider picking it up again? BW: No I dont miss playing, but I may play on my tour. RS: Last year guitarist Tim Weston released a jazz tribute to your music on Blue Note Records called Wouldnt It Be Nice - A Jazz Portrait Of Brian Wilson. What did you think of that album? BW: I loved hearing my songs in the jazz format. It was a thrill. RS: Have you heard Bruce Johnsons new Beach Boys symphonic album? BW: No, I havent. Actually, I have not. RS: Would you ever consider producing a rock symphony album of your own? BW: Well, I dont know...not really, no. I dont think so. RS: I think a theme and variations of Heroes & Villains could take up a whole side! RS: I really enjoyed the Endless Harmony soundtrack. Its a little like The Beatles Anthology series. How do feel about letting fans hear your works in progress? BW: Im proud, because I think Im a very creative genius and Im proud to share with people. RS: From Endless Harmony I really enjoyed the long, ambient version of Til I Die. BW: Right, that was one of my favorites. RS: Also the track Soulful Old Man Sunshine was great as well. BW: Thank you very much! RS: Did you like making the VH-1 Endless Harmony movie? BW: No, it was hard for me actually, cos I was in a bad place in my head. And I had to put on extra makeup. I couldnt stand all that makeup and goop they put on my face! I was just in a bad mood for about two or three weeks, yknow, but I got out of it. RS: What was it like working with Ringo on his Vertical Man album? BW: Well it was a kick, because, yknow of course, hes one of my idols. The Beatles are like my idols. Theyre one of my great idols and heroes in life. And I think he did a really good job as far as like helping me put my part on his record. BW: It started with my secretary. She created it. She created the fan club. RS: I want to ask about some of my favorites songs by you and The Beach Boys. BW: One of my favorites of course is Good Vibrations. It took us six weeks to do it. We did it in three different studios. It was a very hard job to get that all produced, yknow? And of course, Surfin USA was our first really hard rock record. I like that a lot. And, California Girls which I think is our anthem, I call it our anthem, because its a very Beach Boy-ish kind of record, with Mike Love singing the lead. RS: Id like to know about a bootlegged song you made back around 1990, called Save The Day. BW: I dont know, I cant remember the song. Do you know anything about it? RS: I remember the words, Lennon said it best, Lets give peace a chance. BW: I remember that! Yeah, I thought that was a very brilliant idea to put on record. RS: It just got right into my soul. BW: Good! Im glad it did! Great! RS: How about the song you recorded on your 1988 solo album called Let It Shine? BW: Yeah, that was written with Jeff Lynne from the ELO. RS: Was Lynne singing on that one? BW: I dont think he was, no. I think I did all the background parts on that. He wrote the lyrics. I didnt write very much of that song. He wrote most of it. BW: I love the chorus (sings) Someone, oh someone oh someone to Love. I remember that. I loved it! RS: Its a great rock and roll song. BW: I know. Thank you very much. I appreciate that! RS: The song you wrote for the Beach Boys Love You album, called Solar System. Thats another favorite of mine. Are you interested in astrology? BW: Astrology? Not really. I used to be, but not any more. RS: Do you remember anything about that song? BW: I thought it was a very creative idea for a song. And I thought that, Solar System, brings us wisdom...I just thought it was clever lyrics. Did you think so? RS: I thought the lyrics to Solar System were really cosmic. BW: They were clever, werent they? RS: The song you wrote on 15 Big Ones called Back Home. Its such a great rock song. BW: I call it a country song. I dont know about rock. I call it a country-rock song. I think it had great lyrics. In the very first part where I go, A yeah, yeah, yeah!...I thought that was cute. RS: In retrospect I think its the best song on the album. RS: What about another obscure song called Lazy Lizzie? BW: Lazy Lizzie was cut...I cant remember, in the 70s? Im not sure who did it. I remember that from a long time ago. It was one of the best things we ever did. Was that a bootleg? RS: Yeah, I have it on the In My Room bootleg. How about the song which just came out on the new Beach Boys Ultimate Christmas CD, called Winter Symphony? BW: Yeah, that was written by me and Al (Jardine). It is a good tune, isnt it? I forgot all about that tune, yknow? All of a sudden I remember it again. RS: How about a song called This Isnt Love that came out recently on the Windham Hill album called Songs Without Words. BW: Oh, that one! That was written in 1979. RS: Another rarity called, That Special Feeling. BW: Where was it from? RS: I think it was one of the outtakes from The Beach Boys Love You. BW: Maybe, I dont know that one. BW: Oh! I remember that. Yeah, that was a cute song. RS: One song that stands out in my mind from the Surfs Up album is, A Day In The Life Of A Tree. Its probably the ultimate ecology song. Its a really special song. BW: In some ways it was. I remember doing it. I remember how we used that pipe organ. Actually it was called a pump organ. That was one of the more special songs that we had. It was a good record. RS: One of my favorite songs by the Beach Boys is Our Sweet Love, from the Sunflower album. BW: Oh yeah, I remember that. Carl sang that, I think. RS: Did you write that whole melody? BW: Yeah. I think so yeah. I think I wrote that tune. RS: How about your version of This Could Be The Night from the 1995 Harry Nilsson tribute album called For The Love Of Harry: Everybody Sings Nilsson. BW: Andy Paley asked me to do it with him. RS: Another favorite of mine is Make A Wish from Sweet Insanity. BW: Im considering rerecording that one too. Great song, very up. RS: Anyway Brian, can you give us any ideas as to what your next album will sound like? BW: Well, its gonna have that Phil Spector type beat. With a little bit of the Four Seasons kinda vocals, and a good Beach Boys vocal. And hopefully, at least half of it will be hard rock and get it on with some rock and roll. I hope we can! I mean the Boys were big in the 60s yknow? And theyre still big in the 90s. RS: I know you live part-time in Chicago. Will you be going back there? BW: I dont know. Maybe in January? RS: How do you like living there? BW: I dont like it. I like it here in L.A. better. RS: So youll go on tour with the music? BW: On February 11th were gonna cut out on a tour. RS: So youre gonna come to New York I hope. BW: Maybe, we might, yeah. RS: Id love to see you do a show at Carnegie Hall! BW: Oh, thatd be great! RS: I remember all the Beach Boys shows at Carnegie Hall right after Surfs Up came out. I remember they even played songs like Cool, Cool Water. BW: They couldnt reproduce the record on stage, like it was in the studio. But, they got pretty close to it. RS: Actually, the first concert I ever saw was back in 68 when the Beach Boys headlined a show in Miami Beach with The Buffalo Springfield and The Strawberry Alarm Clock. BW: Oh! no kidding, I didnt know about that! RS: So the next album will sound different than Imagination? BW: Its gonna sound more like...you like to hear rock and roll? Well I think its gonna have some good rock on it. Like with the Phil Spector type of rhythms. I think his rhythm is good. RS: I hope that your new record company, Giant Records gives you the support you deserve. BW: Yeah, I hope so! RS: Maybe I shouldve written a longer interview. But this seems pretty good. BW: I think so too! I think youve got most of it together! RS: Brian, thanks a million for speaking with me!